Well, the good news is that my daughter’s new lunch box, a Laptop Lunch Box, arrived! The bad news? It’s still too heavy for her to carry in her back pack. What does this mean? It means that I have a new lunch box, of course! For the rest of this year we will just pack our daughter’s snack in her soft Dora the Explorer lunch bag in our leftover take-out tupperware and she will re-inherit both her Planet Box and her Laptop Lunch Box when she’s a little bit bigger. So, here is my Laptop Lunch debut! What I like about it is that the containers are deeper than in the Planet Box. However, it’s plastic. Planet Box is not. Also, the Laptop Lunch Box has its own built-in cutlery and is microwave-safe. Major win! Shrimp-Avocado Salad – from this recipe on Kaylin’s Kitchen, modified by using homemade mayo a la this recipe. Calling it tasty does not do it justice! This compartment has a lid, I should mention :). Please look for a post offering a full comparison between the Planet Box and Laptop Lunch boxes in a little while – once I’ve had some hands-on experience with the new box! Well, the day has come! My 3.5 year-old is starting her first session of summer camp. It will be a little bit scary (no naps at camp! ), but a great ‘trial run’ for when she starts school in September. And it will be our first time sending her out for the day with a packed lunch (her daycare provides lunches). 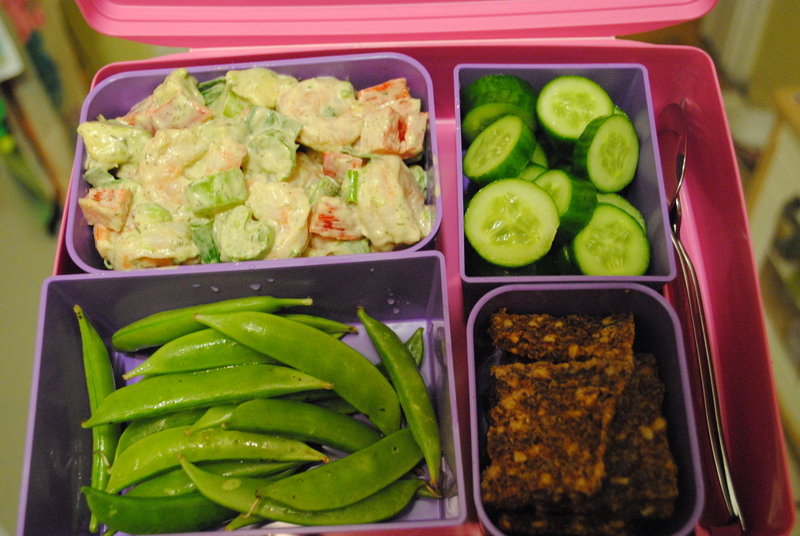 So….here is her first lunch box. We try to feed our daughter Paleo, but have had trouble getting buy-in from others in her life, so we allow rice crackers as a bit of a compromise. What I love about the Planet Box lunch boxes that she and I both use is that they come with adorable magnetic ‘decorations’, which also allowed me to note that she is GLUTEN FREE for her camp counsellors, in case any of the children share food…hopefully it’s a helpful reminder (and it makes me feel better!). Note: ALL contents in this lunch box were purchased from the farmers and producers at our local farmers’ market! Nothing makes me happier than market day, aside from knowing that my kiddo is eating food from people we know personally and trust with our health.